Chamblee Dentists: How Do You Find a Good Dentist? That’s really a tough question. And for our practices (in Sandy Springs and Chamblee, GA) it’s even more difficult because we don’t advertise using conventional methods. Ninety-five (95%) percent or more of our patients are referral based, either from an existing patient or another referring dentist. Given our history and experience, we recommend asking for referrals from a co-worker or a neighbor. If you have relocated from out of state to another city or state and want to find a good dentist, get a referral from your previous dentist or at least their second opinion. This is probably the best option as your previous dentist probably knows someone he went to school with or has a professional affiliation with. It is unlikely that he would give you wrong advice. If you simply are not happy with the services given by your current dentist, you can ask for recommendations from your co-workers, friends, family members, and other trusted individuals in your life. We have found that once someone makes a referral, the referred patient will go to our web site or reviews to validate the referral. A combination of a trusted referral borne out by independent research will usually lead you to the right dentist. If you are planning to undergo any kind of dental treatment, you need to make sure that you get the services suited to your needs. Choosing a quality dentist with the right skills and experience is the deciding factor in the success of the treatment. While price is a factor, a well-respected dentist with long standing roots in the community is not going to be overpriced. You certainly would not want to base your decision on an inexpensive root canal and crown treatment which could turn out to be ineffective in just a few months. Dental issues are no small matter. You should in no way compromise on the quality of the dental treatment based on price. If it’s cosmetic dentistry you are seeking, then look for a prosthodontist. Prosthodontic dentists are with the passage of time gaining popular recognition as patients become more familiar with the advances in dentistry and how they can enhance their everyday lives. They are expert dentists with a post graduate ADA recognized degree from a dental school centered around a complete knowledge of dentistry, where function and aesthetics are combined in the final result. Again this is a tough one. You should not necessarily choose a dentist whose office is pretty close to where you work or live. This will surely help you in case of a dental emergency, but with a quality dentist as a general rule you shouldn’t have emergencies. Obviously, if you can find a quality dentist close to where you work or live in Atlanta, you will reduce hassle for you in driving many miles just for treatment which requires frequent visits. But for twice a year cleanings and examinations a few more miles shouldn’t create any issues. Whichever dentist you choose in your locality, always make sure that he/she is a certified member of the American Dental Association (ADA). When you are comfortable with your referral, compare the services, charges, dental insurance formalities, and other determining factors, before choosing a suitable one. After you find all the above conditions satisfactory, simply call for a consultation. Or you can make an appointment with us – 404-256-3620 or 770-455-6076. 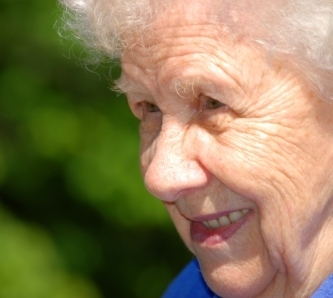 More and more, oral health care is playing a greater role in maintaining our aging population. It has become vital to older patients as it relates to their overall global health. Oral conditions affected 3.9 billion people, and untreated caries in permanent teeth was the most prevalent condition evaluated for the entire Global Burden of Disease 2010 Study (global prevalence of 35% for all ages combined). Oral conditions combined accounted for 15 million disability-adjusted life-years (DALYs) globally, implying an average health loss of 224 years per 100,000 population. DALYs due to oral conditions increased 20.8% between 1990 and 2010, mainly due to population growth and aging. 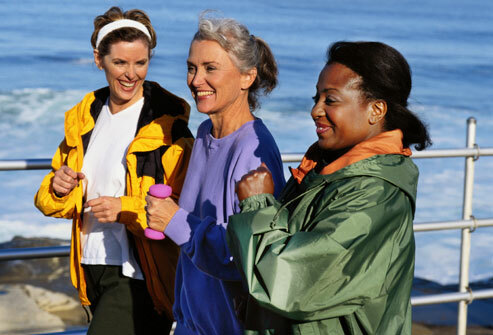 By 2015, the US population is expected to increase to 312 million (3.08 million in 2010) and 14.7% of the population will be aged 65 years or older. While effective preventive measures exist for younger populations (water fluoridation, dental sealants and parents), no preventive measures have been devised to address the expected increase in oral health needs of the aging population. IADR President Helen Whelton from the University of Cork, Ireland, elaborated, “The fact that a preventable oral disease is the most prevalent of all 291 diseases and injuries examined in the GBD 2010 is quite sobering and should cause all of us to redouble our efforts to raise awareness of the importance of oral health to policymakers.” The dental profession has an opportunity to take a leadership role in the delivery of health care services to the seniors who have contributed so vitally to our society’s well-being and who deserve to be treated with the best oral health care we have to offer. This can only be accomplished with a better educated population. Dr. Scheinfeld is a prosthodontist specializing in geriatric care. The Right Smile Team, including in-house implantologist Zoey Scheinfeld is designed to treat our aging population. Call for an evaluation of your oral health care needs. Dental Expenditures are a bargain… for now. The overall average for personal healthcare has risen much faster than the average for all consumer items, nearly quadrupling in the past 25 years. Whereas per capita spending dental costs have remained flat. Coupled with the effects of inflation and population growth the general shift from institutional care spending toward professional services has created little to no increase in ones dental costs. 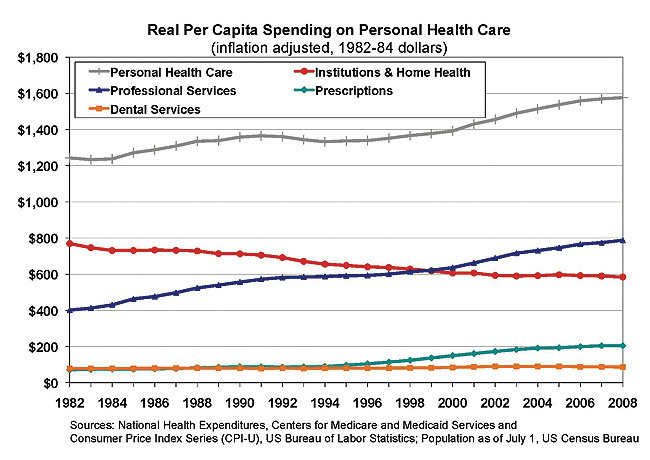 Medical care is increasingly delivered in outpatient care settings, often in physician offices or surgical care centers, which can be seen in the above diagram crossing of the real spending trends for institutional care and professional services that occurred in about 2000. Unlike other professional services, dentistry has not gained from the shift toward outpatient/professional services, having remained flat in real per capita spending for the past 25 years. Thus, while prices for dental services have grown generally as fast as the average for all personal healthcare services, dentistry has neither lost nor gained real ground in per capita use. Most dental coverage in the United States is obtained through employer-offered plans, and basic Medicare does not include such benefits. Seniors’ spending on dental care is, therefore, more sensitive to income than spending by younger age groups. Whether dentistry will continue to maintain its relative position in per capita utilization depends, at least in part, on how the baby boom demographics will impact dental care demand in the next two decades. Dental Implants have changed the face of dentistry. What used to be a difficult procedure is now the standard of care. As with most treatment procedures today, dental implants not only involve scientific discovery, research and understanding, but also application in a practical sense. The practice of implant dentistry requires expertise in planning, surgery and tooth restoration. The role of a prosthodontist as the ‘quarterback’ in the process is as much about their art and experience as it is about their post graduate training. The dental implant is actually a replacement for the root or roots of a missing tooth. And like tooth roots, dental implants are secured in the jawbone in a process known as osseo-integration. Hidden beneath the gum-line, they are used to secure crowns (the parts of teeth seen in the mouth), bridgework or dentures by a various design means. They are made of titanium, which is lightweight and strong, but most importantly, they are biocompatible, which means that it is not rejected by the body. Titanium’s special property of fusing to bone is the biological basis of dental implant success. Placing dental implants stabilizes the existing jawbone. Along with replacing lost teeth, implants help maintain the jawbone’s shape and density, ensuring your facial skeleton is also maintained. This means they also support indirectly, the soft tissue structures — gum tissues, cheeks and lips. Dental implants help you eat, chew, smile, talk and look completely natural, transitioning the patient to a well maintained physical appearance. So the final question is ‘are you a candidate for dental implants’? If we can be of service please do not hesitate to contact us. Canker sores most often heal on their own in one to three weeks. See our dentist if you get a large sore (larger than a half inch, or about the size of a dime). You may need medicine prescribed to treat it. Taking good care of your teeth and gums can help you avoid or lessen these oral health problems. If we can be of service, please do not hesitate to contact us in our Chamblee or Sandy Springs office. Many children benefit dramatically from aesthetic dental care on their primary teeth. Be sure to consult with your dentist if you have questions about whether aesthetic dentistry is right for your child. In our Chamblee or Sandy Springs office we can be of service by giving us contact for a complimentary consultation.